Private tenants in Britain in 2018 paid £59.1 billion on rent - that’s £1.9 billion less than in 2017 and the first fall in a decade. The data comes from Countrywide’s high-end brand Hamptons International, which produces a monthly lettings sector market report. Hamptons says the 2018 fall has been driven by a drop in the number of households renting and rental growth stagnating. In the long term, however, and assessed over the last 10 years, the total rent bill has increased by £29.9 billion in Great Britain. Between 2008 and 2018 the number of households privately renting has grown by 1.7 million (that’s a rise of 52 per cent) and rents have increased by 12.4 per cent. In 2018 nine out of 11 regions in Great Britain saw a fall in their total rent bill: the East Midlands and the North East were the only regions to see a rise. London saw the biggest drop off in the total amount of rent paid by tenants. last year: renters in the capital paid £20.6 billion in rent in 2018, £0.62 billion less than in 2017. Meanwhile Hamptons also says the rate of rental growth has slowed over the last 12 months across the country. In January the average cost of a new let rose 0.6 per cent year-on-year compared with 2.4 per cent in January 2018. London led the slowdown over the last year, but rents have gradually started to rise again. The average cost of a new let in the capital rose 0.6 per cent year-on-year in January. 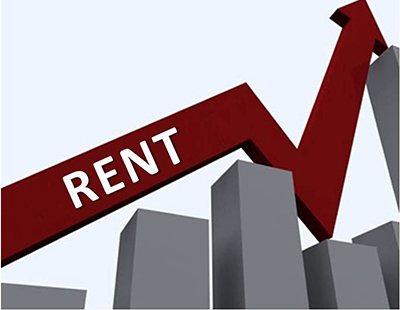 Meanwhile the South East and South West both recorded rents falling 0.5 per cent year-on-year.